Lot of (8) Obsolete Currency Notes from the District of Columbia. Various Issuers and Denominations. 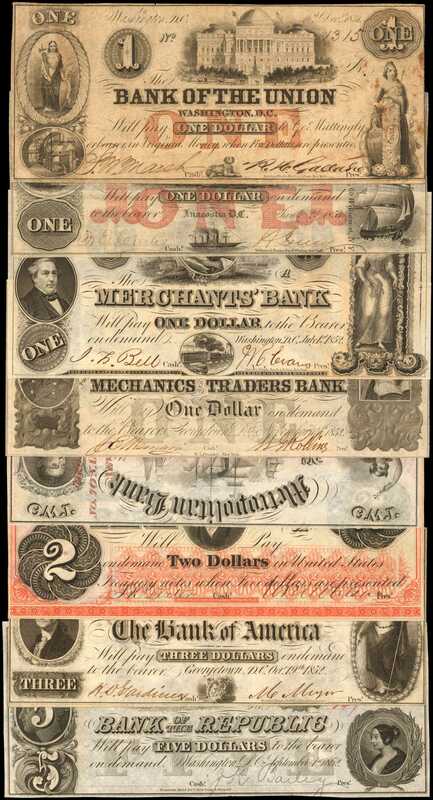 Very Fine to Choice Uncirculated.Eight notes from the District of Columbia seen as follows: Bank of America $3 (CU), Bank of the Republic $5 (CU), Bank of the Union $1 (VF), Bullion Bank $2 (CU), Mechanics and Traders Bank $1 (AU), Merchants Bank $1 (CH VF), Merchants Exchange Bank $1 (AU) and Metropolitan Bank $2 (CH VF, POC). PERSONAL INSPECTION OF THIS LOT IS STRONGLY RECOMMENDED. THERE WILL BE NO RETURNS ON THIS LOT FOR ANY REASON.